Boil 4-6 cups of water. 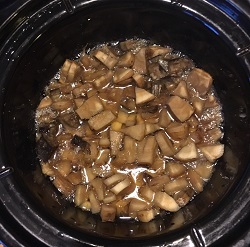 Cover well with boiling water, put the lid on, and set the crockpot on high overnight. 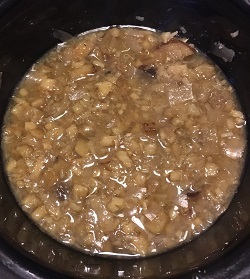 Note: You can make this stovetop, too--it will take a good 30 minutes at a simmer to cook the parsnip and burdock all the way through. In the morning, mash the veggies with a potato masher and let them cook a bit longer if needed. Put 1/2-3/4 cup cooked veggies in a bowl when first made or in a pot on the stove when reheating. 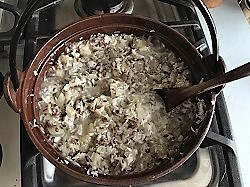 Stir in the shredded coconut, flax seeds, and salt; if simmering to reheat, add a little more water as needed. 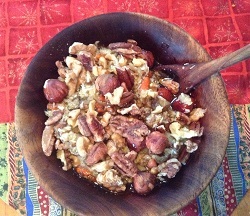 Serve with goji berries, nuts, and a generous squirt of flax oil.